This applies to both question length and survey length. Question text should be as short and as simple as possible so as not to force the respondent to scroll down the page. The length of the survey should also be as short as possible and only one question should appear per page. The correlation of survey length with abandonment rates was tested by Carey Stapleton in 2013 on desktops and smartphones. She found that abandonment rates on a 44-question unoptimized mobile survey reached 15.9 percent, while a 26-question survey that was optimized for mobile had an abandonment rate of only 6.3 percent. Clearly, making a survey concise and mobile-compatible can lower recruitment costs and save respondents time. Pictures and graphics, even when shrunk to fit a smartphone screen, can be unassumingly large files. Most smartphones still do not have the processing power to load large pictures as quickly as desktops and will force the respondent to wait while pictures and graphics load. Question types become extremely important on mobile screens as they impact user experience and response validity. The two most compatible question types on a smartphone are drop-downs and vertical radio buttons. Radio buttons should be displayed vertically as opposed to horizontally to prevent the respondent from having to scroll to the side and potentially missing one or more answer options. One study by Peytchev and Hill in 2010 tested horizontal radio buttons on a smartphone and revealed that 23 percent of respondents either did not know there was another answer choice to which they had to scroll or that it was too much effort to scroll and see it. This notion was further illustrated by Carey Stapleton in 2013 in a survey that tested horizontal radio buttons, some of which were hidden off-screen. 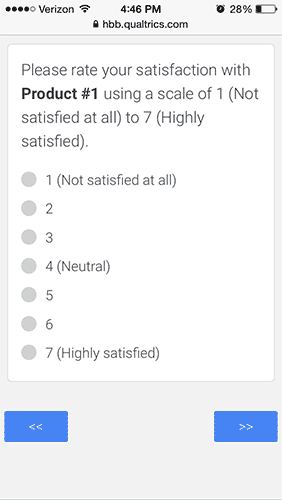 Respondents were asked to rate their satisfaction with the survey and were split into two groups: Some saw the unsatisfied side of the scale first while others saw the satisfied side of the scale first. Even on a desktop, users will naturally pick the first option displayed slightly more often – 5.7 percent in this case – but this effect was exaggerated with horizontal radio buttons on a mobile device and elicited an 11.6 percent difference in responses from the two groups. Smartphones allow much more room for vertical radio buttons, which should be used whenever possible because of the decreased likelihood of having to scroll to reveal hidden answer options. One of the hardest question types to display on a mobile screen is the matrix. 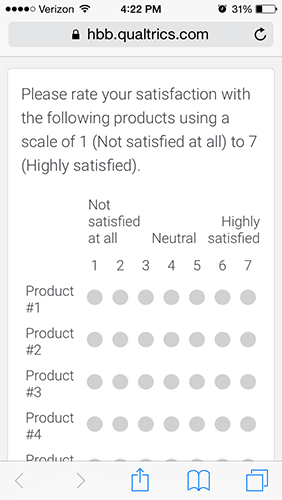 Matrix questions should not be displayed in a grid with the traditional horizontal Likert scale on mobile screens as the options and labels will end up too close together and might require horizontal scrolling. Matrix questions are best displayed as drop-downs that reveal the answer options, or as vertical radio buttons with one question/statement per page. 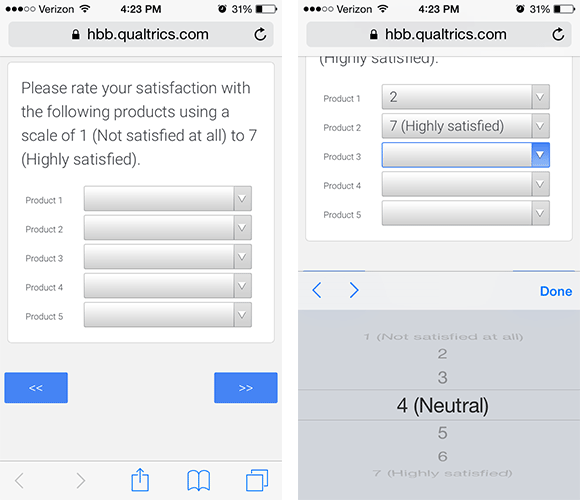 Use embedded data and display logic to display mobile-friendly questions when necessary. It is imperative that researchers test their surveys on multiple devices, operating systems and browsers to get a sense of the compatibility of their questions on different screen resolutions and in browsers with varying capabilities. One method of measuring the compatibility on different devices is to include a question in the survey that asks for the respondent’s device type. If there is a noticeable difference among drop-off rates, this likely means the survey is not displaying correctly on some devices. 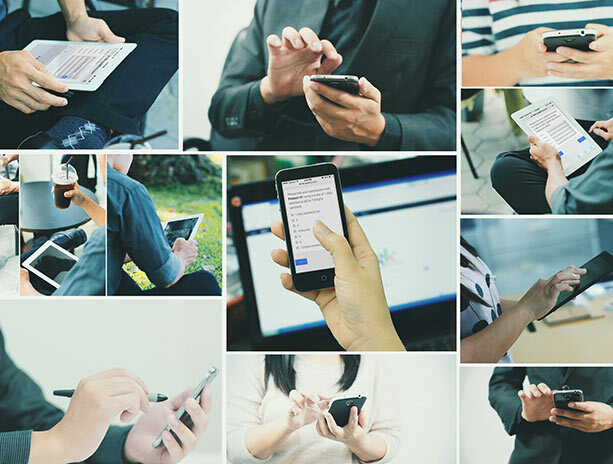 Try out these four steps on your next survey and make sure you are able to test the results by using metadata or embedded data to track the type of device each respondent is using. Let me know how it goes and if you have any tips or tricks to add to the conversation! However, I’m not so sure about your recommendation regarding drop down menus. Quite a lot of the literature suggests that drop-down boxes should be used sparingly and only for long lists. Compared to other response formats they require multiple actions by the respondent and therefore, increase response burden. Great point! Drop-downs do require extra actions; however, they also allow for multiple statements (or products in this case) to be rated on one single page, which we have found helpful in the data gathering process. To your point, they are appropriate when displaying lists that would be burdensome if the statements were separated onto multiple pages. I would still contend that drop-downs are more appropriate than horizontal radio buttons, but when it comes to choosing between drop-down menus and vertical radio buttons, it’s best to decide on a case-by-case basis as there is no one-size-fits-all solution. Thanks for reading and for sharing your feedback!